I was with legal Win7. Everything was working fine. Recently I updated to Win10 and the HSF cannot start on port 80. I need it to be at that port in many reasons. It is working on other ports now (for example 8000), but I need it in 80. Please HELP!!! Sorry but I don't understand how to solve the problem. Can you please explain again in a bit easier? What I did was to disable the W3SVC (World Wide Web Publishing Service) and now it is OK. Thanks for posting your solution here, it may help some future user with the same problem. Although the topic is old, here's one addendum: Port 80/443 might also be blocked by the Skype application. That's right. 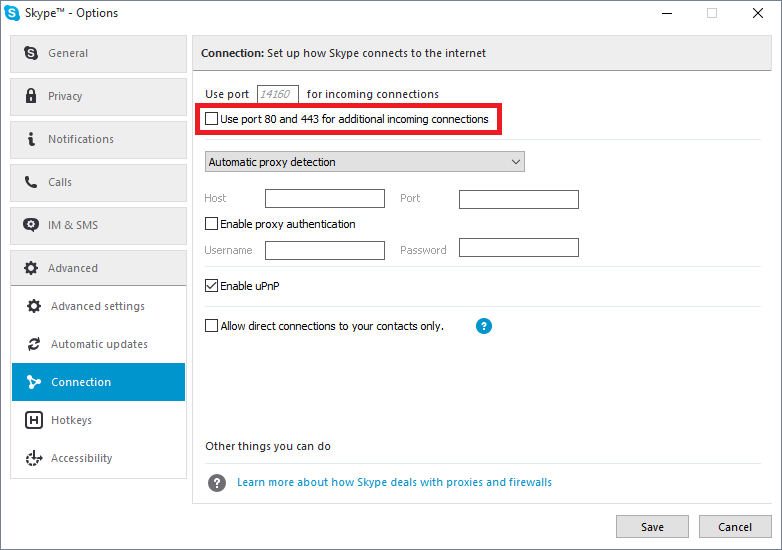 To avoid Skype grabbing port 80/443, we should uncheck the option “Use port 80 and 443 for additional incoming connections” in the Skype settings. This applies not only to Windows 10, but to XP, Vista, 7, 8, etc. yes. HFS tries to tell you the name of the application using the port.